A few weeks ago, before we headed out on our trip to Europe, I shared with Erlend a Google doc containing an extensive list of restaurants, bakeries, shops, and neighborhoods that I wanted to check out when we were in London and Amsterdam. 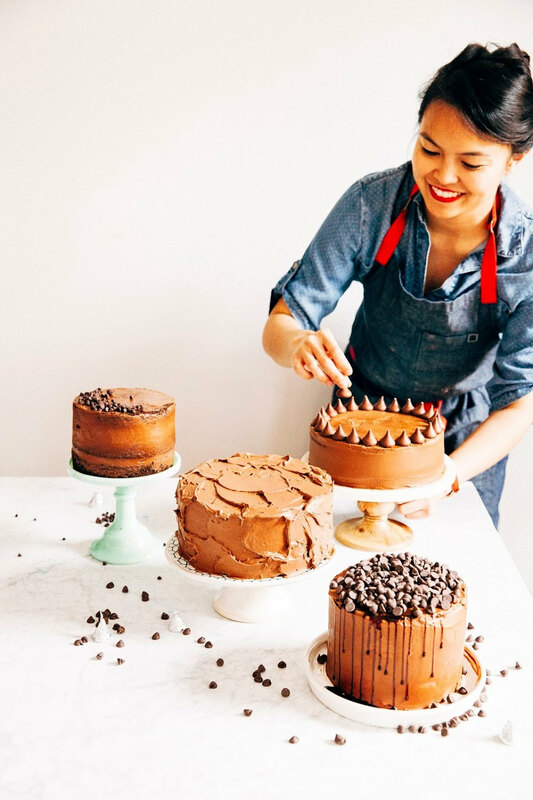 The list was comprised of a mix between critically-acclaimed restaurants and bakeries, as well as personal recommendations made by family, friends, and blogger and Instagram acquaintances. At the top of the list for London was Nordic Bakery, a bakery specializing in Scandinavian pastries. Erlend’s parents had randomly come across the bakery a few years ago during their travels; his mom had bought their cookbook on a whim after a morning of enjoying their pastries and coffee. And every time I visit their apartment in New York City and browse through their extensive book collection, the Nordic Bakery’s bright blue, minimalist spine always catches my eye. I inevitably pull it out from the shelf and spend the next few minutes getting lost in the pictures and recipes of hearty cinnamon rolls, beautiful rye buns, and Scandinavian cakes. Finally, it was my turn to go. On a rainy morning, Erlend and I trekked our way to the Nordic Bakery location on Golden Square in London’s hip Soho neighborhood. True to form, we ordered a miniature feast for breakfast consisting of karelian pie, tiger cake, butter buns, and flat white espresso drinks (Which, by the way, why are flat whites not a thing in the US? They're delicious!). 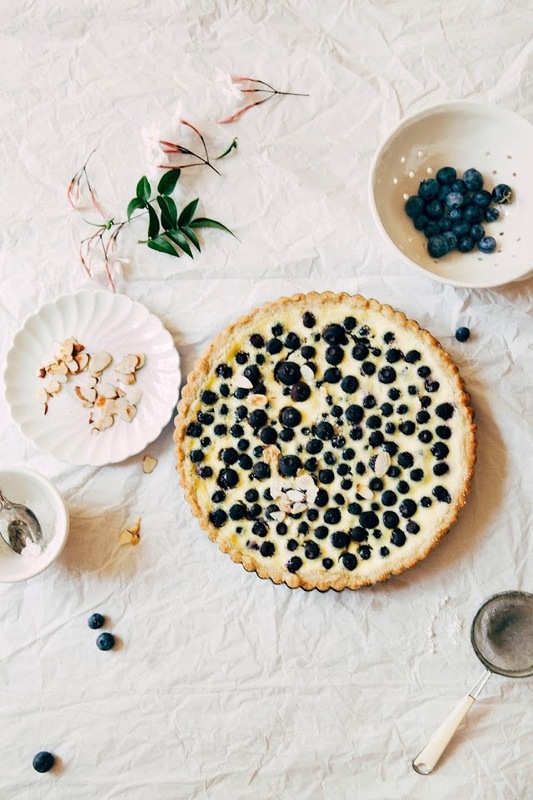 And just when I thought that we had stuffed ourselves silly with all the carbs they were offering, they brought out their showstopper: the prettiest blueberry custard tart with a gorgeous, beautifully browned rye crust. I wanted a slice, but literally had no more room in my stomach. Erlend managed to talk sense in to me, pointing out that I still had four other bakeries in the area on my list that I wanted to visit (including the original inspiration for this blog, The Hummingbird Bakery). We reluctantly left without a slice. But still — it’s been a few weeks since that morning, and I still find myself thinking about that tart. So I decided to make it at home! 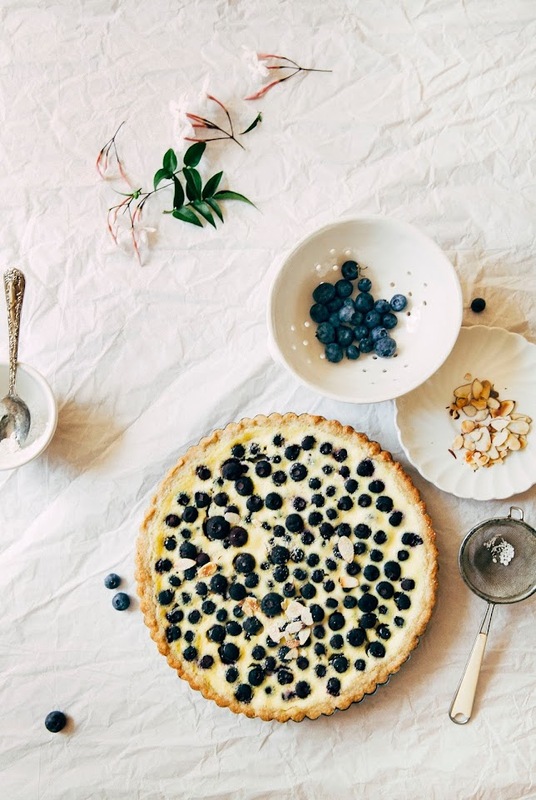 This tart is the true definition of Scandinavian, but in dessert form. It uses rye flour in the shortbread pastry, giving the tart an incredibly tasty hearty and wholesome flavor that you don't often see in pastries. The tart filling was also pretty Nordic in its flavors — fresh, seasonal blueberries tossed with sour cream and almond extract. Because the original recipe was pretty solid, I hardly made any modifications with the exception of throwing in a little kosher salt into the crust and topping the tart with a dash of powdered sugar and a sprinkling of toasted, slivered almonds. Delicious. Not a fan of blueberries? Feel free to substitute with any other berry that you prefer! In my opinion, raspberries would be the perfect alternative. The tart crust dough can be a little bit sticky to work with, so be sure to reserve an additional 1/2 cup of all-purpose flour or so to dust your hands with as you work with the tart dough. Center a rack in the oven and preheat to 400 (F). Prepare a 9-inch tart pan with a removable bottom by spraying liberally with cooking spray. Seriously, go all out — this crust has a tendency to stick to the pan. Set aside. In a medium bowl, whisk together 3/4 cup all-purpose flour, 1/2 cup dark rye flour, 1 teaspoon baking powder, and 1/2 teaspoon kosher salt until well combined. Set aside. In the bowl of a freestanding electric mixer fitted with a paddle attachment, combine 6 1/2 tablespoons unsalted butter and 1/2 cup granulated sugar. Beat on medium-high speed for 2 to 3 minutes until the mixture is light and fluffy. Use a rubber spatula to scrape down the sides of the bowl, and turn the mixer back on to its lowest setting and add 1 large egg. Continue beating until the egg is well incorporated into the mixture. Once the egg is fully incorporated into the butter and sugar, Scrape down the sides of the bowl, and turn the mixer back on to its lowest setting and add the dry ingredients (from the 2nd step) all at once. Continue mixing until the ingredients clump together and create a dough. Turn the dough out onto the prepared tart pan. Use your hands to press the dough into the tart pan, creating an even layer across the bottom of the tart pan and up the sides of the pan. As you do this, be sure to dip and cover your hands into the 1/2 cup of flour that you reserved earlier — the dough can be quite sticky, and flouring your hands prevents the tart crust from sticking onto your hands as opposed to the pan. 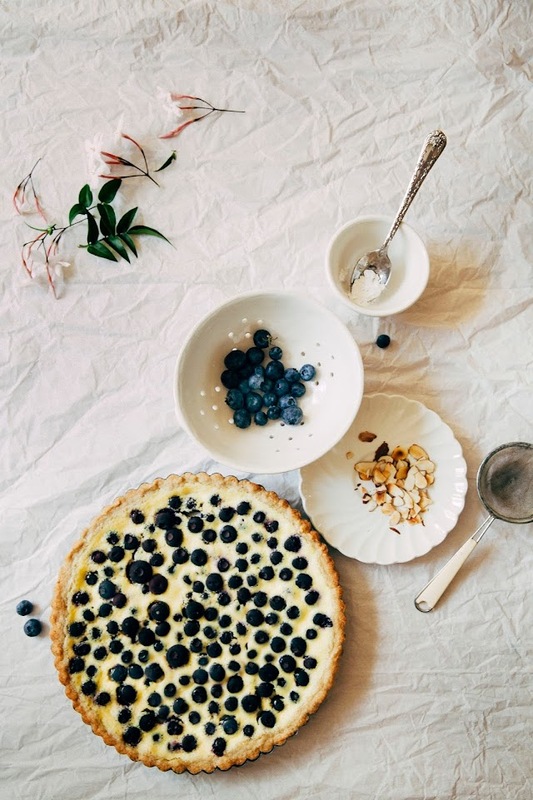 When you've finished preparing the tart crust, place the tart pan on a parchment lined baking sheet and set aside. 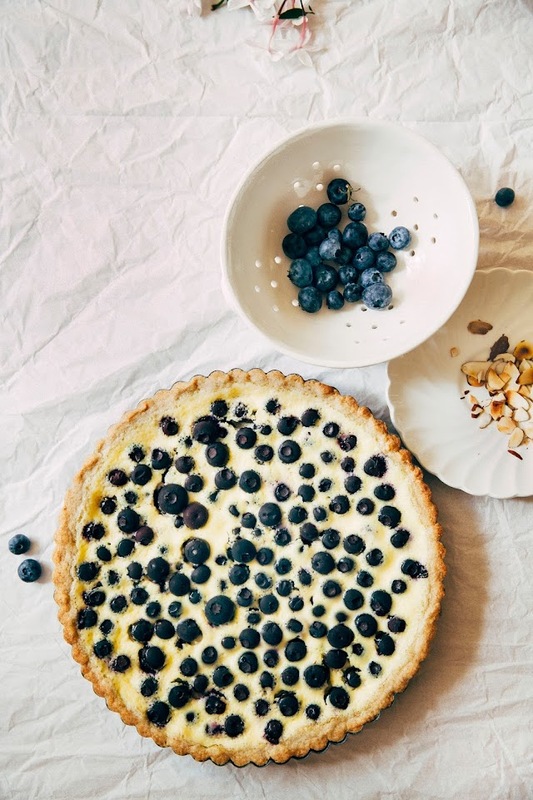 Make the tart filling by whisking together 5.5 ounces sour cream, 1/3 cup heavy cream, 1 large egg, 3 tablespoons sugar, and 1 teaspoon almond extract until well combined. Pour the tart filling into the prepared crust. 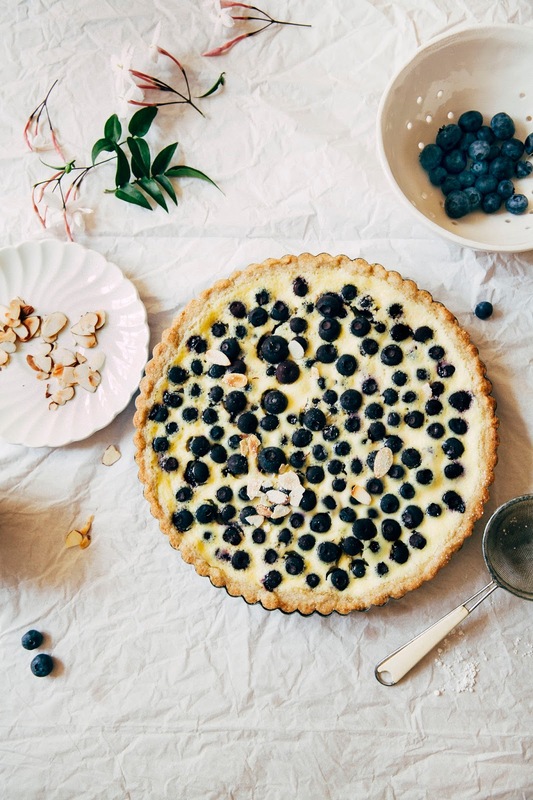 Take 10 ounces fresh blueberries and evenly distribute them over the tart filling. Bake in the preheated oven until the filling has set and the crust is golden, about 25 minutes. When you take the crust out of the oven, the center of the crust should wobble ever-so-slightly, while the outsides remain set. Cool on a wire rack. Serve warm, or chilled from the refrigerator. I went to the Nordic Bakery for the first time last Summer and it was amazing. I wish I'd ordered more than just coffee and a cinnamon bun but I will definitely be re-visiting soon. This looks gorgeous. I love a custard tart...custard anything really!...and I really like the idea of the rye crust. I love making the stuff I try out at restaurants or bakeries at home! And I would love to make this! I love the blueberry and custard combo. So delicious! Ah lol yeah there's always too many places to visit / too many dishes to try when you're abroad, but how lovely that you can make it at home!! This looks so pretty and perfect for summer. This looks fantastic!!! I'm working on a custardy berry pie right now, aren't they fantastic? Your breakfast in Soho sounds amazing! I've spent some time in London but haven't really checked out the food scene as I was always travelling on a tight budget. The next time I'm there I'll definitely check this place out. This looks fantastic! I must admit until this summer I was never on team blueberry. I know! It is crazy! I'm looking at this, drooling, and looking back at the empty pint of blueberries I just ate. Looks like I'm going back for more. Oh my gosh, YES, why are flat whites not a thing here? The funny thing is that I had my first flat white in a European style cafe in Beijing, of all places. It was so tasty! 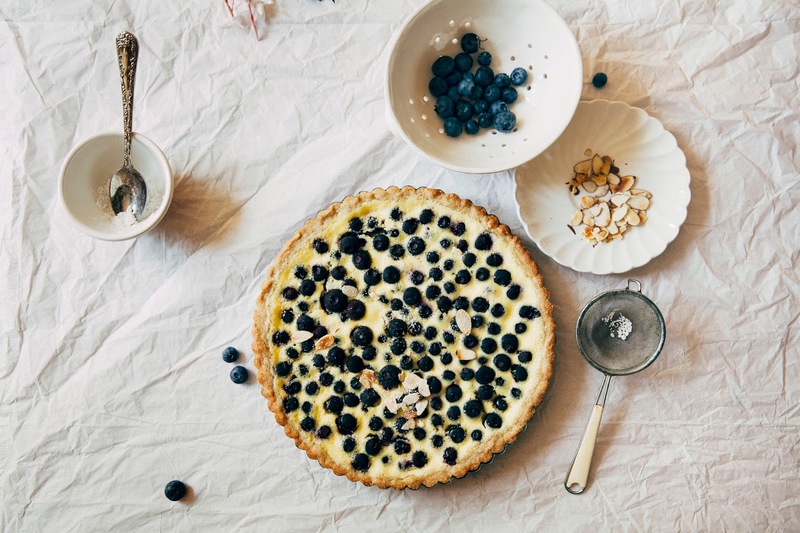 blueberry almond custard sounds so amazing! what does the crust end up tasting like? i'm thinking of the rye bread you get on pastrami sandwiches, but this crust seems to have a gentler amount of rye flour in it. Thanks Betty! Yeah, if I miss something while traveling, I usually tend to obsess about it while at home. Thankfully the internet has given us so much access to recipes – you can make all sorts of things at home now, from Shake Shack burgers to cronuts to pastries like these. Yes! I can't wait to see what you guys end up whipping up over there. I'm sure it'll be delicious! For sure! England has never had the best reputation for having good food, but I was pleasantly surprised when I was in London. I had such wonderful meals there — you can definitely still get good food on the cheap, especially if you do your research beforehand. Haha, I feel you. I wasn't a fan of blueberries for a long time, up until living in Oregon. Oregon just has the best berries and produce in general! Hahaha, I love it. I hope you get the chance to make it! Right??? I've actually heard that flat whites are a thing in Asia, especially in China, Singapore, and Taiwan. They originated from Australia initially (I think? ), and since those places are closer to Australia, they're more easily available there? But I could just be making that up completely, lol. The crust turns out to be softer than a lot of traditional pastry crusts and it's definitely not as bitter and hearty as traditional rye bread. It's almost a gentle whole wheat toasty flavor. Ah! This is so pretty! 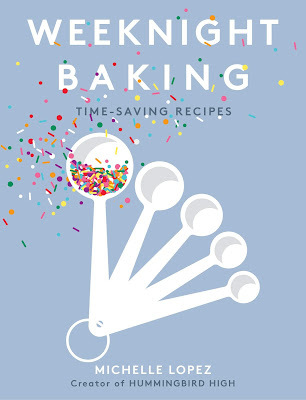 I am smitten with Scandinavian baking and now I've pinned like 3 books, including this one to buy. Ha! i have not tried any Scandinavian desserts but i can already tell how heavenly this must be..
Rye shortbread. You just rocked my world. This looks amazing -- and easy to make too! Can't wait to try it. Also-- do they not serve flat whites at Starbucks now? Thanks Cindy! I wish I still lived in PDX so I could lend you my copy. Scandinavian desserts are great! Very simple, focusing on classic flavors and healthier grains. Definitely worth a try! I'm not sure! I rarely go to Starbucks. I did notice, however, that in London the Starbucks there offer flat whites... I didn't think the American ones had it on their menu though? Amazing tart I must say. Looks absolutely delicious and I'm quite sure the rye crust is something to die for. Of course, your perfect photography is also to blame for the incredible looks of this. It does look like flat whites are now on their US menu as well, going by the website? Oh wow! That's so interesting about flat whites in London. I also didn't realize that London had a large Aussie expat population, but it makes sense when I think about it now. And I agree, it is much easier to be a tourist a lot of the time. In Portland and San Francisco, I always ignore things and "wait until the hype dies down", which really means just years and years of procrastination until I go check it out, lol. Wow, this looks so good! I am actually going to London in the fall, so I'm adding that bakery to the list of places! I've never actually had a custard tart...sounds delicious though. I'll definitely be trying this. Ooh, good idea. I love that substitution! Rye ice cream?! I don't even know what that is, but that sounds amazing. Also, of COURSE. Katie, I think we've determined that we're dessert soul sisters! Yay! I hope you get a chance to try it in London, and at home! I had the worst time with this cake! Neither the batter nor the frosting got fluffy. I'm a pretty accomplished baker so idk what went wrong! I'm seriously starting to suspect my Kitchen Aid! Or the humidity. Did your cake taste eggy? I'm hoping when it's all together it will taste great. Any tips would be greatly appreciated! Thanks! This looks delicious and lovely presentation !! This is just too, too beautiful. Your photos in this post are simply stunning Michelle. I've never actually been to the Nordic Bakery (oops) but I think I need to change that asap. I enjoyed this recipe. I substituted Lactose free milk and yogurt for the heavy cream as my family is Lactose intolerant. The recipe turned out creamy and delicious. It was easy to make as well, the pictures helped a lot. Great! I'm glad those substitutions worked out! Thanks for giving the recipe a try! Thanks for all the great recipes, I cannot wait to try out the rest! I am always so overly ambitious when I travel! I compile a big list of places and, like you, end up stuffing myself silly. No regrets, though, because those are the tastiest memories! 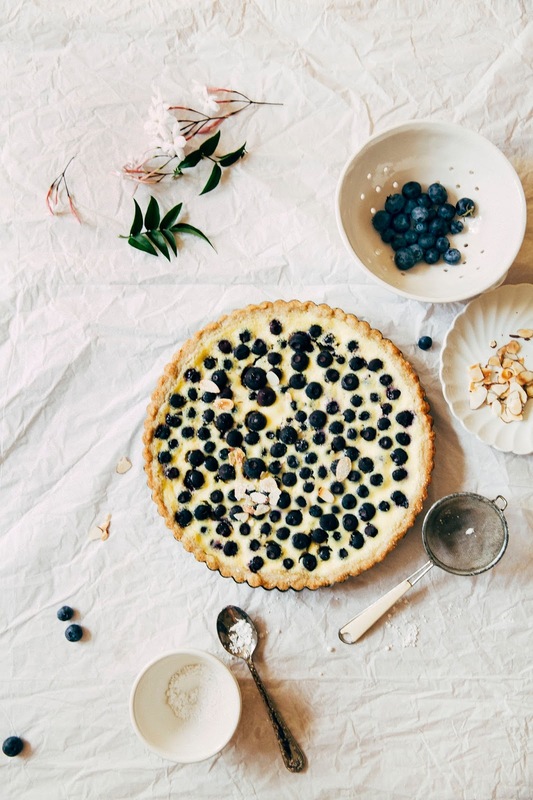 I can't say I've ever properly tried Nordic baked goods but everything you had at that bakery + this tart just sound heavenly. Can't wait to check it out the next time I'm in London! Yes, you're right! I think it did come from Australia (unless the Australian dude I met in China lied to me). It does make sense that those countries would serve flat whites because of the proximity. Plus, I'm sure there are a bunch of Aussies traveling to those countries all the time! I'm going to Copenhagen in September so I hope I'll get to try some fun pastries too! Also what is a flat white espresso?? Um, ok. I now realise that the flat white is *not* a central part of everyone in the world's coffee-drinking career... wut?! IT SHOULD BE! That's so sad that you couldn't fit in the slice of tart but your version looks so incredibly good and classy that I feel like you have more than made up for it!